First time to the forums. Before I buy the duet 2 wifi is the panel duet needed ? I'm upgrading my Anycubic plus and if the current screen isn't compatible, but with the wifi is a screen needed ? The Duet boards can be fully controlled with the included web interface. You can use your laptop or even a small cheap tablet with a browser to access it. @resam The convenience of the PanelDue depends on how close the printer is to a computer. Mine is within a couple of metres and although I have a PanelDue, I rarely ever use it, preferring the larger screen that a computer gives me. Not used here and works well without. Printer sits next to my computer and I can also connect on mobile device like tablet or phone if required. No, it's not needed. In my case the printers are not near my computer so the PanelDue is very handy. I would not want to work in my setup without the PanelDue. As everyone else has said, the Paneldue is useful but not necessary. The DWC hosted on the Duet board provides more information and control ability that the Paneldue, in part because the Paneldue firmware hasn't caught up to the Duet firmware (I may be wrong- it's been a while since I updated). The Paneldue can't show you the chamber heater setting and temperature, for example. The Paneldue does have a uSD card slot along the bottom edge that can be used to transfer gcode files to the Duet as long as you allow for access when you enclose the Paneldue. If you're going to be transferring gcode to the Duet via network, it can be more convenient to just use a computer and DWC. If you like the panel type form factor but want the info and control provided by the DWC, you can use a tablet with a browser. You can even do that if you have a Duet Ethernet by using a usb to network adapter with a tablet. Not needed, I had my due 5i in the box for a week before I installed it. That said, if something goes south and you need to stop the printer, and if Murphy is around and your network is down it's good to have a backup, what is also good is if you have a massive file to print, the SD slot is right there to pop it into your PC to download then stick into the printer. I'ts also nice to use to jog the axes around and swap out filament on the fly. I would recommend one if or when finances allow it. I couldn't imagine not having it at this point. It's great for quickly setting temps, homing, jogging, running macros, tuning speed and extrusion on the fly while you're watching the print. Plus my laptop isn't always next to the printer. So needed? Technically no. But totally worth it. I'm still setting my Duet 2 Wifi up and have lots of work to do, but it is printing. 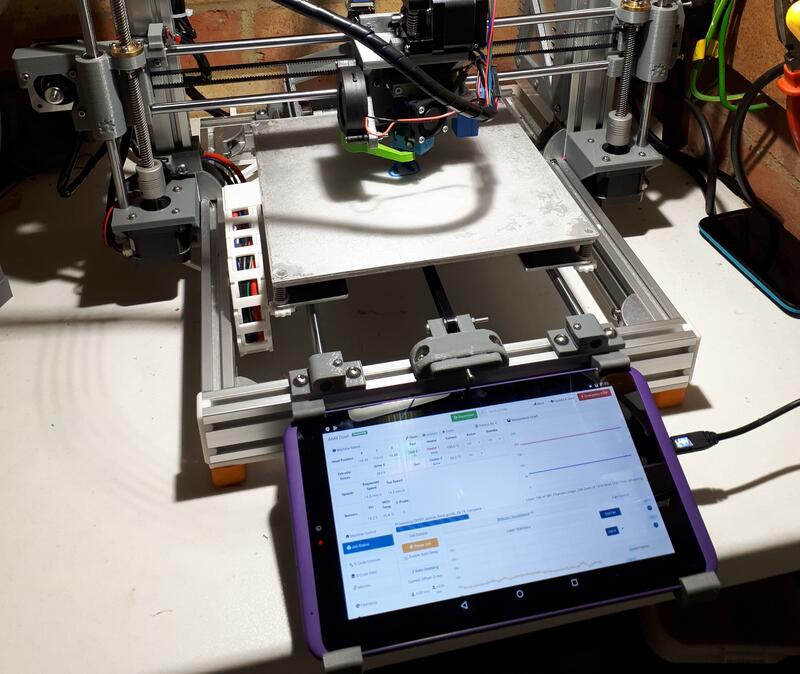 I love having my LCD display, if I need to print another copy of a part I've already uploaded I can do so from the LCD panel and can control the printer from where the printer is rather than going back and forth to my computer half way across the room. It's handy for sure. But not needed. Ha! yeah, my printer is in my garage, my PC is in my room, so it's past one room, a long hallway and into the garage. A cell works, but fat fingers can cause accidental print canceling! That's a bit of a distance. I don't yet trust my X5SA enough to start a print where I can't keep an eye on it. Once that first layer goes down I ignore the printer. @jamesadoty Same, you should always watch the first layer, be it to ensure quality or to ensure it's not destroying itself in the other room. By the time I send a print, I have time to get over to it while its heating up, or, use the panel to send initialize it. Heh...everyone has an opinion so I might as well throw my two burritos in! Short answer...PanelDue is not needed, but I have found it to be very useful. I use my LapTop via the WebConsole to control the printer, but I use the PanelDue for ancillary tasks and status reports. If on a budget, you can get along without it, but, it is useful and is convenient at times. Like seeing what (DHCP) IP the DUET controller has been assigned.